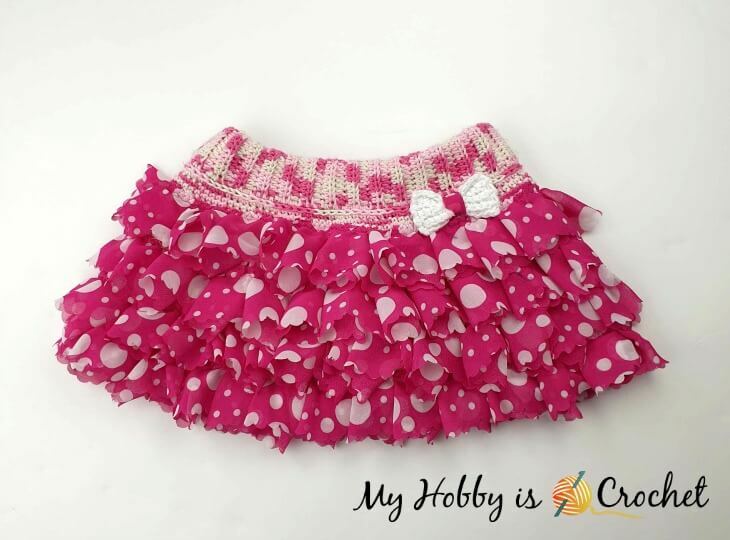 This adorable ruffle skirt is crocheted using Red Heart Boutique Sassy Fabric, a soft fabric strip with evenly spaced holes you can crochet into. One of the great things about the skirt, is that you will crochet the inner lining and the ruffles at once, working with both yarn and Sassy fabric at the same time. A part of the yarn used in this project was provided by Red Heart Yarns. When I first started this project, I was afraid that one hank of Sassy fabric might not be enough to complete the skirt, but to my surprise I had quite much left over. So, even if you would like to make more ruffle rounds or maybe go up a bit on skirt size, one hank of Sassy should be enough. Skirt measures 21 cm from top to ruffle bottom. The skirt is worked top down, starting with the waistband crocheted sideways in rows. 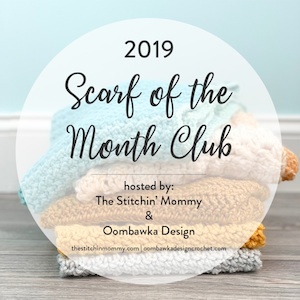 The body of the skirt will be worked top down in joined rounds, while the fabric ruffles will be crocheted as you go working with both yarn and Sassy fabric at the same time! That means that you will make the crocheted “lining” and the fabric ruffles at the same time! 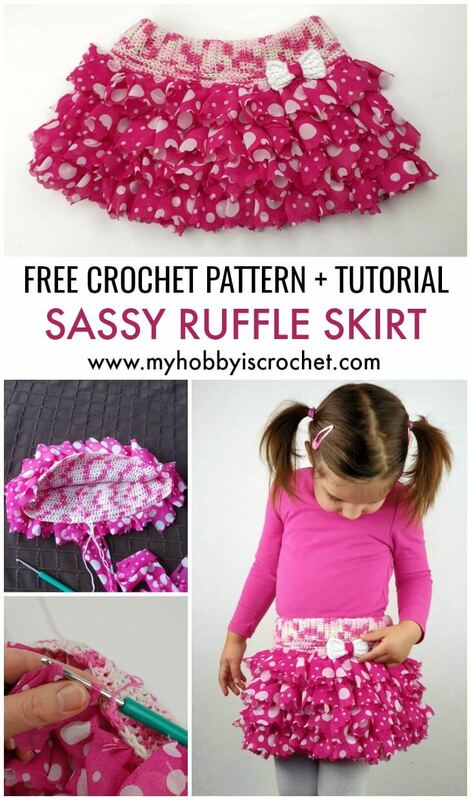 Because the skirt is worked from the waist down and you crochet the ruffles upside down, make sure to hold the Sassy fabric with the wrong side facing you, so that the ruffles will fall on the right side over the crochet lining when the skirt is finished. To make a ruffle round you’ll need a total number of sts multiple of 5! Do not cut Sassy fabric at the end of a ruffle round! Drop it at the front of your work to be picked up later for the next ruffle. having 2 loops of A on hook, yo and complete a sc. Watch my VIDEO TUTORIAL below to learn how to crochet the S-sc and how to crochet the ruffles with yarn and Sassy Fabric at the same time! Rows 3-60 (Or number of rows needed to reach the desired width around the waist. ): Repeat as row 2. Join short sides together with sl st along. Take an elastic and wrap it around the waist of the child, so that it feels comfortable. Cut and sew the ends together. 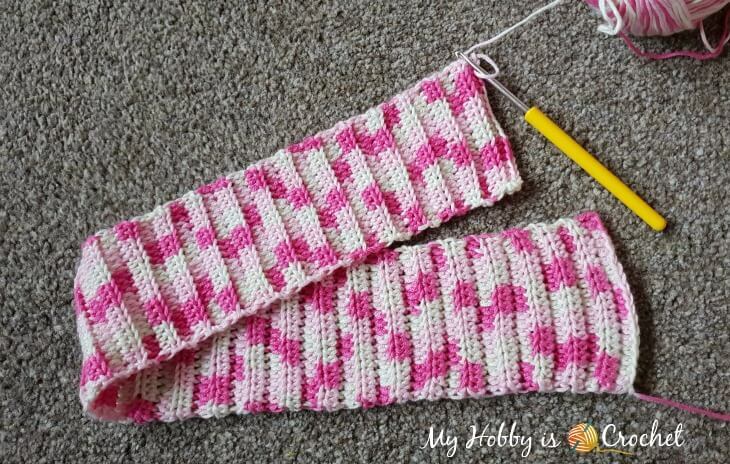 Fold the crocheted waistband in half over the elastic. 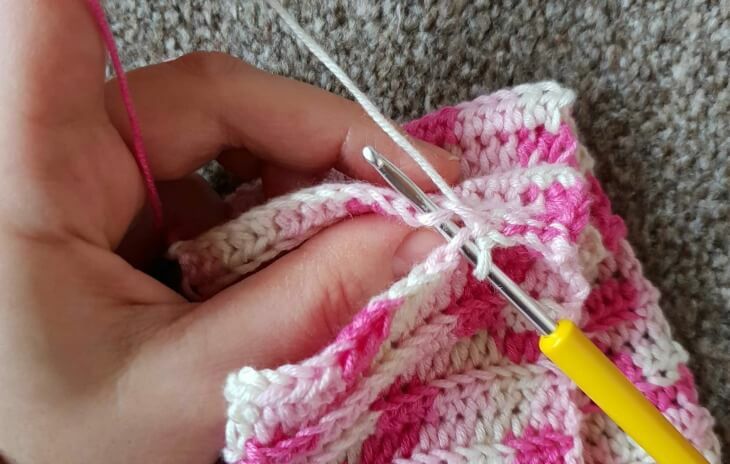 Round 5 (First ruffle round): ch 1 with yarn A, *work 1 S-sc into first st, work 1 sc with A into each of next 4 sts; repeat from * around, join with slst to first st.
Watch the VIDEO TUTORIAL to learn how to crochet S-sc! Round 9 (2nd. Ruffle round): ch 1 with A, pick up Sassy from where you left it and work the same way as for first ruffle round. Round 13 (3rd. Ruffle round): ch 1 with A, pick up Sassy from where you left it and work the same way as for first ruffle round. Round 17: (4th. Ruffle round): ch 1 with A, pick up Sassy from where you left it and work the same way as for first ruffle round. Rounds 20-21: ch 1, 1 sc in each st around (135 sts) Cut yarn. Fasten off. Note: For a longer skirt, add more repeat rounds. To give a nice finished look and to close the gaps between the ruffles and crochet lining, sew with the sewing machine or by hand around the top edges of the ruffles. Join yarn A and work a round of surface crochet sts right below the ribbed waistband. 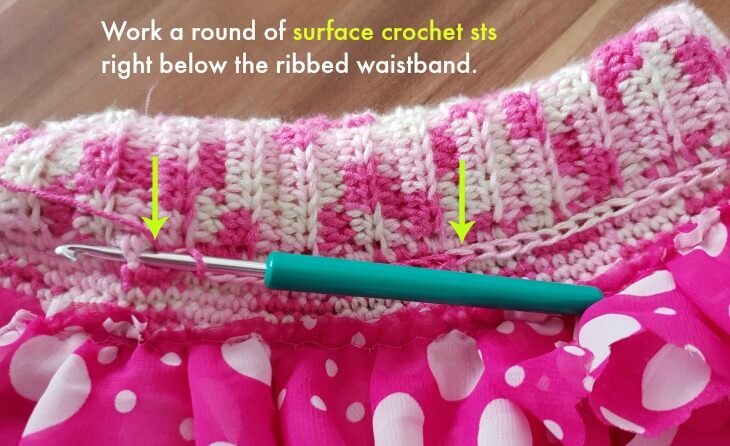 For smaller/larger skirt sizes, follow the instructions for the waistband and crochet so many rows, until the piece fits comfortable around child’s waist. 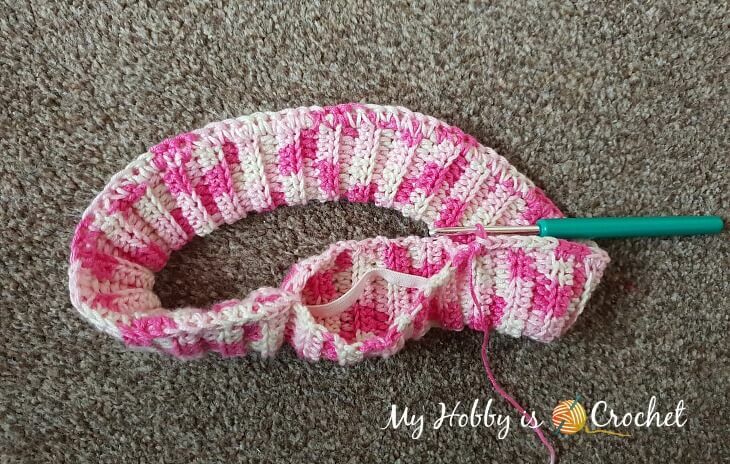 After finishing the waistband, crochet evenly around, then the next round, increase evenly around, so that at the end of the increase round you’ll have a total number of sts multiple of 5 (that is important for the ruffle rounds). Make as many ruffle rounds until you reach desired length. To give the skirt a bit of an A-shape work evely increases before next ruffle rounds. Using white yarn, follow the instructions from my Ridged Bow pattern. 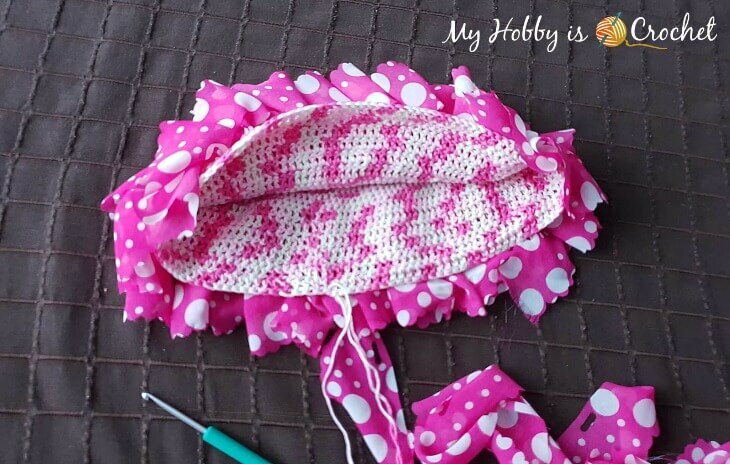 After crocheting the bow, take a piece of Sassy fabric, fold it and wrap it tight around the center of the bow. 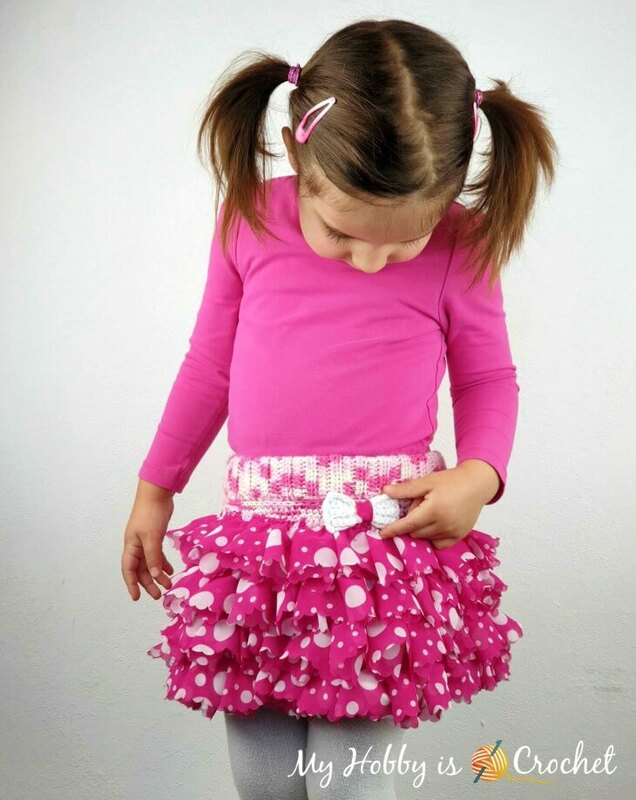 Sew it or glue it with hot glue, then sew the bow onto the skirt just under the waistband. Subscribe to our FREE Newsletter and follow My Hobby is Crochet on Facebook, Pinterest , Bloglovin , Google+, Instagram and Twitter. Many thanks to Red Heart Yarns for providing the sample of Boutique Sassy Fabric used for this project! This skirt is super cute! My duckling would love it! oh my goodness! Can this be done with any ribbon? Hi Milly, You can use any fabric yarn that has holes on the edge, so you can crochet through them.